I don't know what it is that draws me to the Angel Of The North. I usually get edgy when heading down the A1 towards Newcastle, especially if I've forgotten to get my jabs off my GP beforehand, he he. 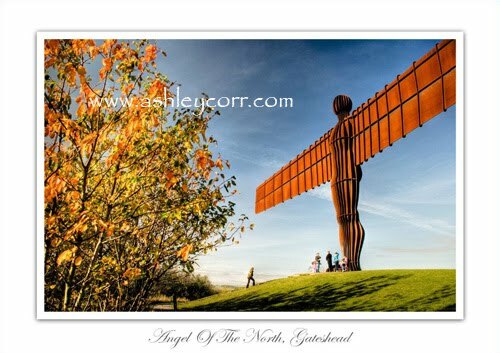 This location is the gat eway to the North-East of England, as thousands of motorists pass through it each day. 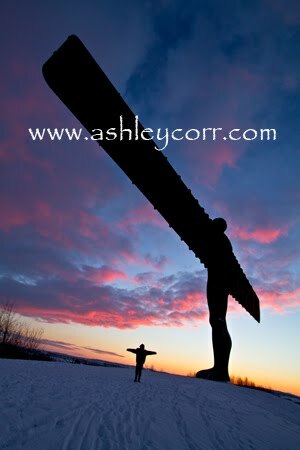 Since spreading its wings in February 1998 Antony Gormley's Angel of the North has become one of the most talked about pieces of public art ever produced. Rising 20 meters from the earth near the A1 in Gateshead, the Angel dominates the skyline, dwarfing all those who come to see it. Made from 200 tonnes of steel, it has a wingspan of 54 metres. Getting up close and personal with the Angel is an experience you'll not forget in a hurry! Apparently, the Angel is as tall as four double-decker buses and its wingspan is as big as a jumbo jet. Ah well folks, ya learn summat new every day, eh. Anyway, enough of the details. Today I made the relatively short journey to the Angel with my son Christopher, who is 9 years old. We done a bit of sledging at the site as the sun was about to set. A good laugh was had. It was back to the car for a quick snack in front of the heaters before returning to the Angel for some photography. The little fella shadowed me as I ran off a few frames, but I wasn't expecting much patience from him in such freezing conditions, so it was 'Job done' and back to the car once again. 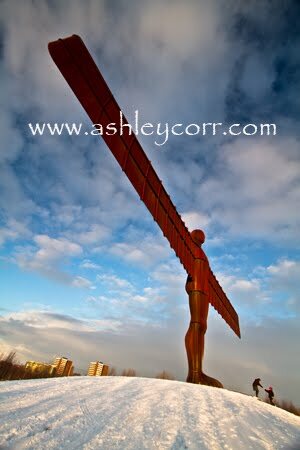 This was my first crack at the Angel with my new wide-angle lens. Great stuff once again! The whole wide-angle effect is shaping up very nicely, ta. Some nice colours in the sky shortly after sunset, which gave me an opportunity to grab some nice shots with visitors in the frame. As cold as it was, it's always worth waiting for people to enter the frame as this lends a sense of scale to the whole 'Angel vs people' scenario. Also, I was metering off the highlights in the sky, which in turn threw the Angel and people into silhouette, which finished the shot off brilliantly...in my humble opinion, of course. The second shot (illustrated here) shows my son posing in an angelic fashion, he he, which is something he is very good at...but only on request! Anyway, you get the general idea of scale with this shot. And that's about it for now folks. I'll be back soon - Thanks for visiting! More recent shots in the snow. Canon 7D, armed with a 10-22mm wide angle lens - ya know...the one I've been prattling on about for the last week or so. 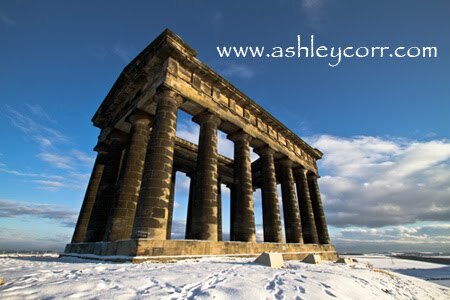 How about this for a dramatic angle - this first shot, taken from a position in one corner of Penshaw Monument, with big elevation to capture the columns like never before. When seeing this through the viewfinder for the first time it really does give an insight into exactly what kind of shot this lens is capable of producing, and I'm already acknowledging the fact that it has been money well spent. Attached to the lens is a Hoya 77mm Circular Polarizing filter, which was bought with the lens, and this will play it's part in pulling in new landscape images. Hoping everyone has had a nice Christmas and looking forward to the remainder of the holiday period. Yes, it's been quite hectic here too and I didn't even get time to post a Christmas message on my blog. I must try harder next year! A kettle full of water later and I was soon driving to my destination. Within a few minutes I was parking up before dashing across the fields like a man posessed. A nearby dog walker looked across and was treated to some impromptu animation as I fell flat on my arse in the thick snow. What to do eh, other than get back up very quickly and pretend it never really happened, he he. I was soon taking pictures though. A few here and there before the sun came up, then some more as the Seven Sisters were bathed in early morning sunlight. 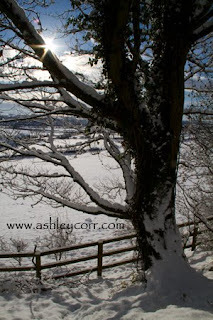 A nice orangey cast across the snow looked even better as it hit the trees in front of me. My new Canon wide angle lens is now giving me a huge advantage over the bog standard 18-135mm effort that I've been accustomed to, so I expect to take my photography on to the next level quite soon. Already this lens is thowing up some big advantages, with tack sharp images at very close quarters. 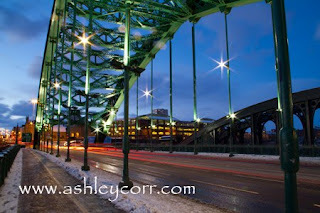 Exciting times for the Mackem photographer! 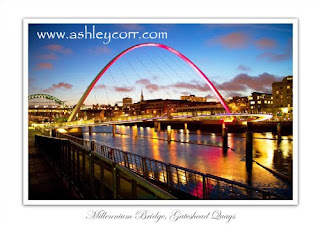 By the way, I still haven't bagged any wide-angle shots at Newcastle Quayside, as promised last week. What, with one thing and another at this busy time of the year. Rest assured though, as soon as time permits, with suitable weather conditions to boot, I'll be down there as quick as a flash. Now, this is one place I'm itching to get to, with the new lens of course. Sorry for the delay folks, but it's gonna happen soon. In the meantime, HAPPY HOLIDAYS!!! It's been a couple of days since I first got my hands on the latest kit bag addition - a Canon 10-22mm EF-S wide angle lens. During this time I've been looking forward to getting out and giving the new glass it's first test in the field. Today, Sunday 19th December, I was up bright and early for some sunrise shots, but alas the sun didn't wanna play, so I attempted some mono shots as Plan-B kicked into action. 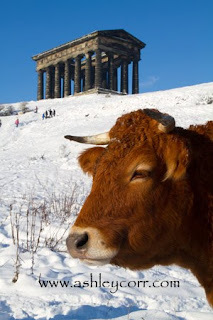 I stayed local, very local infact, at a location in Houghton-Le- Spring, where I live. 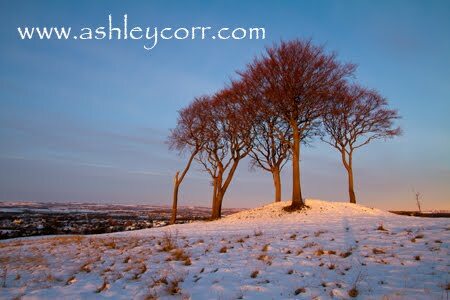 A five minute car journey took me to the Copt Hill Barrow, an ancient burial site which overlooks my home town. Here is where you'll find the Seven Sisters - on a mound in the middle of a large field. It's 8.10am and minus four degrees. Absolutely no colour in the sky whatsoever. Black and White seems the only route to go down, so let's give it a try. I've photographed the Seven Sisters on many occasions, from different angles on this plot. Today I've got the prized wide angle lens on my 7d body and what a dramatic difference it offers. I'm literally standing next to the tree's and as wide as I choose (1omm setting), I'm still filling the frame with my subject. Brilliant! Great angles - something I've never seen through the viewfinder before. Two minutes in and I'm already loving the new lens and can only imagine what results this piece of kit will yield at other locations. Today's subject isn't the best for wide-angle photography, but I'm already noticing a massive difference between the 10-22 and my 18-135 lens that came with the Canon 7D. Infact, I'm already planning another outing today which will see me testing the new lens on some architecture along Newcastle Quayside. This place is tailor made for wide-angle shots! The results will be uploaded to a blog page near you...soon! Early morning, 8 'o clock precise. The location is Roker Pier, Sunderland and the temperature is minus five. The things some people do to get a good photograph, eh. I need me bloody head checking - NOT ARF !! There's a clear blue sky with some decent colour on the horizon, so I waste no time in making my way onto the pier. It looks like I have the pier to myself, which is unusual as there's usually a few fishermen kicking about. I set my tripod up and wait for an improvement in lighting conditions. The fisherman turn up at this point and that's fine by me - let's see if I can include them in the shot! Once again I'm running with long exposures, on the legs with a remote release - selective spot focusing on a 100 ASA setting, exposed in RAW format at 18 megapixels. The shutter trips. It's a good one - I'm happy. 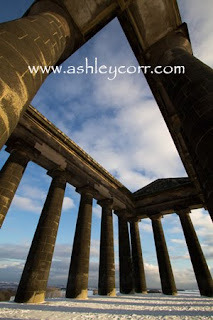 Just before I wrap up this short blog entry - I've splashed out on a new lens! It's been on my wish list for a while and I finally got my hands on it yesterday. It's a Canon 10-22mm wide angle EF-S. These fella's don't come cheap so I'll be pushing it to it's limits and hoping to get a good return on it, starting tomorrow. I'll let you know how I get on. Not a great deal of traffic crossing the bridge as I set up shop, but I'm going for a few light trails on a long exposure just to set the ball rolling. Not a bad shot to begin with. Just a few traces of red light from those tail lamps, but you get the general idea. Turning to my left, I'm now looking out towards the North Sea, with St Peter's Campus and the National Glass Centre in the frame, along the banks of the River Wear. Not a soul about - they're probably tucked up in the fart sack and as warm as toast. One can only wish to swap places right now - it's bloody freezing!! I run off a few frames before the sun comes up, then I beat a hasty retreat to the car. I drove along to Roker Marina and had a quick scout about before calling it a day and heading back to Houghton. 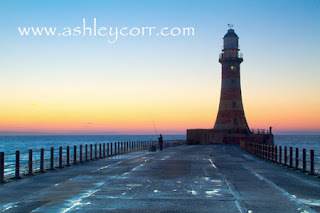 Maybe next time I'll get to the coast once again - I fancy a few sunrise shots on Roker Pier. I'll be back soon. Cheers! 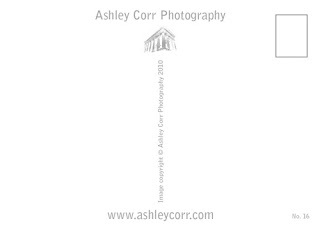 Visitors to my web site may be aware that there is an option to purchase postcards in the Store section. 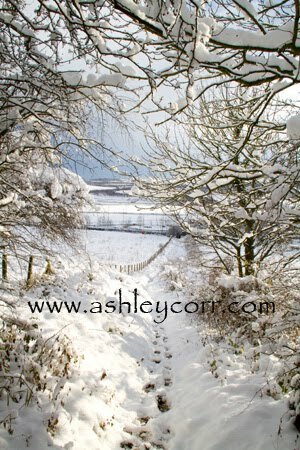 Each card features a local scene and at present there are seventeen cards in the matching set, with new designs earmarked for production in January 2011 and beyond. The whole postcard thing came about purely by chance. 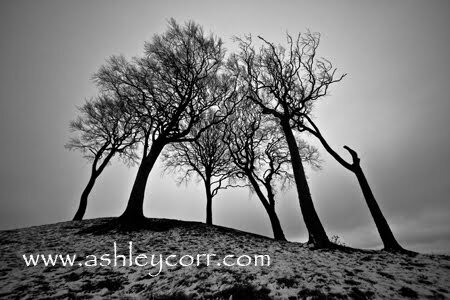 I was asked by a buyer whether I had any postcards featuring my images. At the time I was only producing prints, but I promised to look into the possibility of producing one or two postcard designs just to see how they faired. 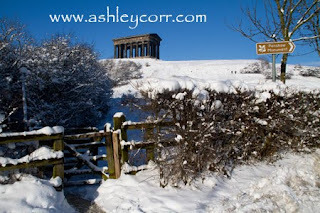 I designed three cards, each featuring a different image from my archives of Penshaw Monument. In turn they were saved as PDF files before to going to print. I was rather impressed with the results! The postcards double up as business cards as they show my website address on the reverse side (see picture below) and the front sides have a glossy finish. Measuring 114x117mm, my postcards are covered by a standard first class stamp, unlike the oversized formats which are not. An initial run of 300 cards were delivered to Penshaw Garden Centre & Tea Rooms, by request, and sales went very well. At this point I designed three more cards featuring scenes from the Sunderland area, before offering them to the Tourist Information Centre in Sunderland. Interest was high and ten different scenes were commissioned, in batches of 200 each, totalling a massive 2000 cards. Initial sales went very well once again and the whole postcard thing was gathering momentum. The postcards were quickly becoming an interesting sideline to my main production of prints, and more recently, Canvas Gallery Wraps. The Cafe Bungalow at Roker Terace, Sunderland (near Roker Pier) then chipped in with a request 400 cards, followed by a 'Big scalp' in the shape of Tyne & Wear Museums who ordered 11 different scenes totalling another 1100 cards! This batch was delivered to the Discovery Museum in Newcastle upon Tyne, although I doubt that's where they'd be going on sale as they featured scenes from the Sunderland area. The most likely destination being the Winter Gardens, Sunderland. So, my postcards have been selling like the preverbial hot cakes - almost 4000 in just four months! More samples have been shipped to other venues, hotels and shops in the region - stay tuned for developments! Meanwhile, to view the full set of postcards - click here. Here are two examples of my postcards, including the reverse side which has it's own unique catalogue number. Click to enlarge. 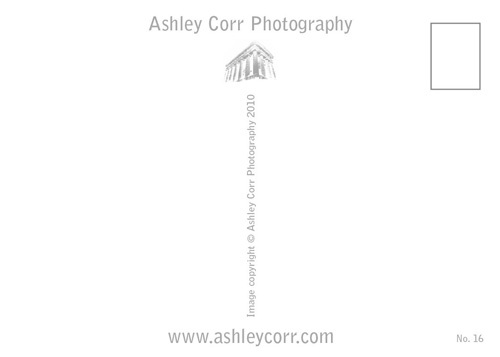 Note : My website address appears on the images above and is for protection purposes only. It does not fot feature on the actual postcards. 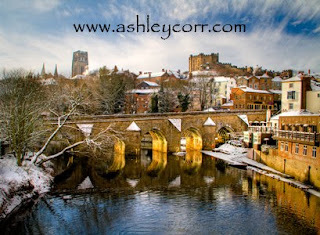 Durham City in the snow. 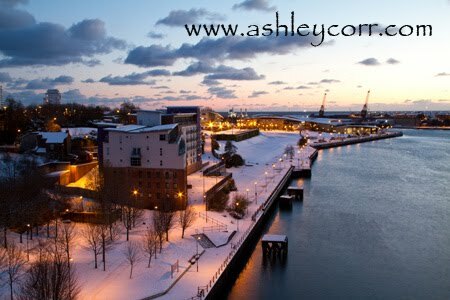 The city centre is one of those places where a photographer can run riot after an overnight snowfall. As the place is steeped in history, the architecture around Palace Green makes for excellent imagery, so you're never short of photo opportunities. 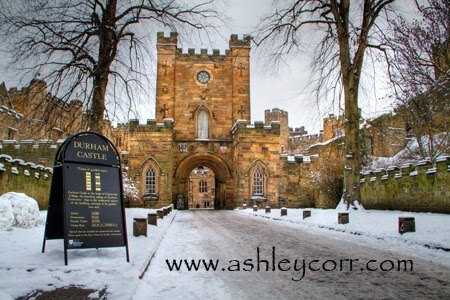 Here I have chosen to include shots of Durham Castle - one from unside the main gateway and the other from outside the castle walls. Friendly Robin's came very close, probably expecting a feed, but I had nowt to offer them in my deep pockets, apart from a lens cap and a mobile phone. Palace Green was out of bounds. Large marquee's covered the entire grass - probably some event, but I haven't anything. It was a very quiet Sunday morning, apart from the scraping sounds from a workers shovel as he cleared snow from the pathway to Durham Cathedral. I kid you not, it was as cold as Siberia! 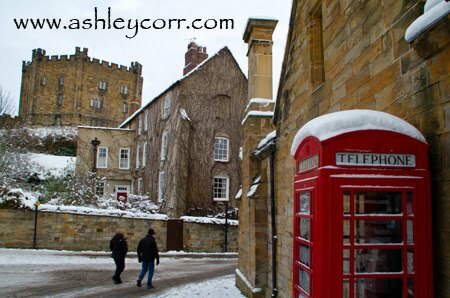 It was minus 6 degrees when I arrived in Durham at 10.0am and I wasn't gonna hang around much longer. After leaving Palace Green and heading down towards Prince Bishops Car Park, I grabbed one last shot of the Elvet Bridge with the Cathedral and Castle as a backdrop. For me, this viewpoint in Durham is one of the best. Last Winter I took a boat load of snow scene shots and my favourite one was very similar to the last shot shown here. 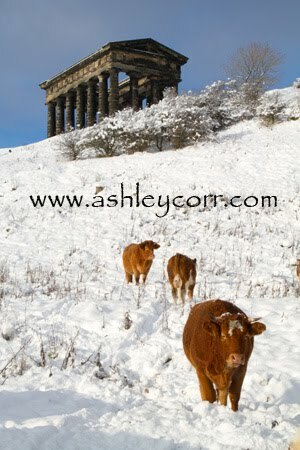 I've shifted a few canvas prints of this one, which to me is a classic Christmas card shot. The time is now 11.00am. Nice blue skies. Hung around for a few minutes, then toddled off back to the car. Switched the heaters on and sat for a few minutes while my fingers defrosted. Reviewed my new photo's on the camera a couple of times before packing it away in the car boot. And that was it. Back to base - job done. Sunday dinner awaits - looking forward to that. Pork, stuffing and apple sauce with all the trimmings. Must dash. This is the second and last part of my visit to Penshaw Monument, which is perched on Penshaw Hill on the outskirts of Sunderland. Whilst taking in the stunning views from the top of the hill, I noticed that the greenhouses on Penshaw Farm were caved in due to the heavy snow. The steel framework has very thin plastic covering so it never stood a chance, so I imagine Mr Green and the boys have their work cut out to repair the damage. The nursery consists of two greenhouses, each around 100 feet long, and I imagine most of his stock is now wiped out. A real shame, although as I strain my eyes I notice the adjacent tea rooms are full of punters - hopefully eying up his walls that are covered with my framed prints, he he. 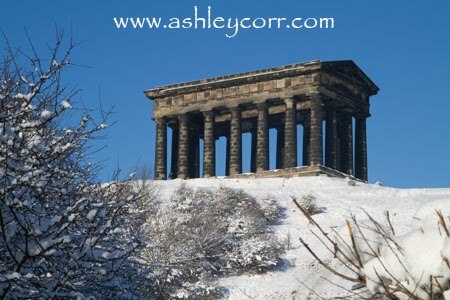 The main road that runs past the Monument, from Penshaw to Sunderland, is full of crawling traffic. Yes, the roads are a pain in the arse once again and drivers are going down the sensible route (no pun intended) by using their heads and not pushing their luck, like some of the idiots you occasionally encounter. Me and my son Christopher (9) join in the crowds on Penshaw Hill as we enjoy some sledging. We each take tus and it's a blast. I temporarily lose control as the sledge deviates from its normal path and cuts across the snow cleared steps, giving me a very sore arse in the process. It was just as well that the little fella was next up, as it gave me a chance to recover as the 'Pain in the arse' subsided. Speaking of Pains in the arse, I must remember to call in at the Mother In Law's on the way home, he he, only joking, Norma! The sledging comes to an abrupt end during my next ride! Yes, the sledge snaps in half and the little fella isn't too happy. The crowd enjoyed it and I laughed myself - what else can ya do, eh. So that was it - back to the car and to grab some much needed heat. After a few minutes we were back out and I took a couple of snaps on a short path next to Penshaw Hill. Here they are. It's been almost two weeks since the first Snowfall of Winter 2010, and there's been no let-up since. Apparently, the last time we had snow as early as November was seventeen years ago, but I bet it wasn't as consistent back then as it has been this year. Snow has been falling almost daily since the last week of November and we've had almost two feet of it up until today, 7th December. 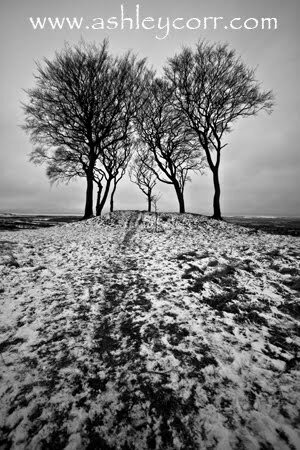 Due to printing and delivery commitments at this busy time of year I haven't had many opportunities to get out in the snow with my camera. Mind you, I always try to arrange some 'Time out' between work and family commitments, and I did manage to get some photography in a few days ago. As expected, the local roads were awful and access routes to places I wanted to photograph were temporarily out of bounds, so I decided to play safe and stay much nearer to home. 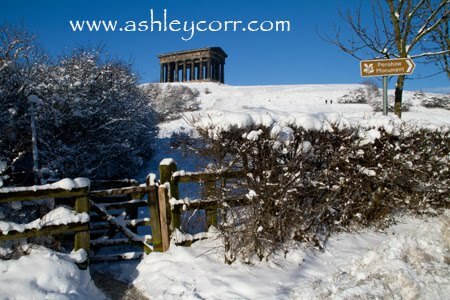 Yesterday I delivered some stock to Penshaw Garden Centre & Tea Rooms and returned to my car, grabbed my gear and headed towards Penshaw Hill. There were lots of people sledging down the hill and the cattle that were grazing nearby looked totally bemused. Ten minutes in and I wasn't exactly amused me'sel - me feet were like blocks of ice - maybe next time I'll not wear slippers!! The snow was atleast a foot deep as I trudged a recently unused path up the hill. It was heavy going. I went over on my arse once or twice in pursuit of the summit, but it was worth it in the end. About two-thirds of the way up the path I entered a small wooded area, with thick snow on every branch in front of me. It was very picturesque. The sky was clear blue and ideal for the camera. Time to start photographing! 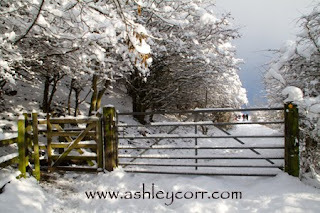 I could see my car parked on the road at the bottom of the hill so I walked down the steps towards it, passing the sledgers en route. Nearly went on my arse again, a few times, but counter balanced the fall to avoid embarrassment in front of the masses. 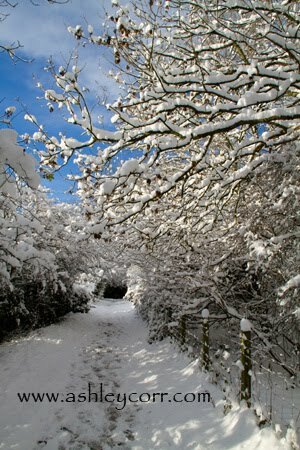 After a dodgy ten minute slow walk down the steps (walking like Bambi on ice) I was safely back to the car, so in I went. The heaters were blasting in a vain attempt to warm me through. I got there eventually. 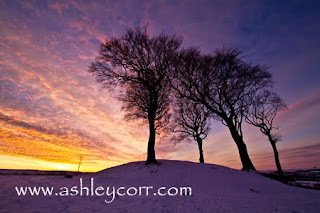 Anyway, here is two more photo's from my freezing adventure in the field. Cheers! God's Country, I hear you say. Well, I am biased of course, as Sunderland is the place where I was born and bred. A visit to the town centre at the tail end of Autumn 2010 was originally a business visit to the Tourist Information Centre, to deliver a large amount of stock in preparation for Christmas. No photography was planned, although I did have the Lowepro Trekker, fully loaded, in the boot of my car, just in case. It certainly came in handy! On my return to the car, which, for the record, was parked in St Mary's multi-storey, I had a quick look out the top storey window towards the Stadium Of Light. What a view! A clear day presented a perfect opportunity to shoot digital across the River Wear, which flowed below the Wearmouth Bridge just in front of me. The Autumn colours were on display, adding some fine colour to the landscape and finishing the shot off perfectly. Panning from left to right I fired off three frames before jumping back into the car and heading for home. Gotta admit, I love this panoramic effort. I have it printed, mounted and framed - ready for the Tourist Board in early January 2010. I think I might just sell one or two!